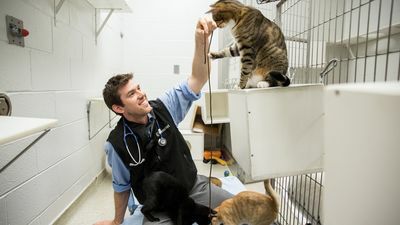 LIFE AT VET U follows the lives of six veterinary students during the most crucial, final weeks at the University Of Pennsylvania School Of Veterinary Medicine. With animals' lives on the line, the students have to undergo rigorous training as they face the day-to-day challenges inherent in this high pressure world. With more than 30,000 patient visits a year and species ranging from dogs, cats, guinea pigs, iguanas to horses, cows, zebras and goats, the University is home to two internationally renowned teaching hospitals with some of the largest caseloads in the world. 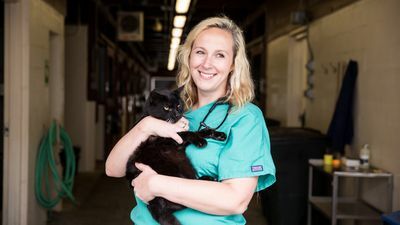 LIFE AT VET U established the first-ever facility for the care of critically injured large animals, the first state-of-the-art minimally invasive surgery suite, the first recovery pool for equine orthopaedic surgeries, and the world’s first animal bloodmobile. Among the students who are driven by a mission to heal and protect animals, new friendships blossom and relationships evolve as life-changing moments alter their worlds forever.